The team of Highsnobiety, Campless, and Kick Posters are back once again with an analysis of the most valuable sneakers on eBay. This time, they&apos;ve combined their quarterly lists to introduce the top earners of 2015 as a whole. We&apos;ve already covered some of these findings, but the most jaw-dropping figure has to be the total amount spent on Kanye West&apos;s adidas sneakers. 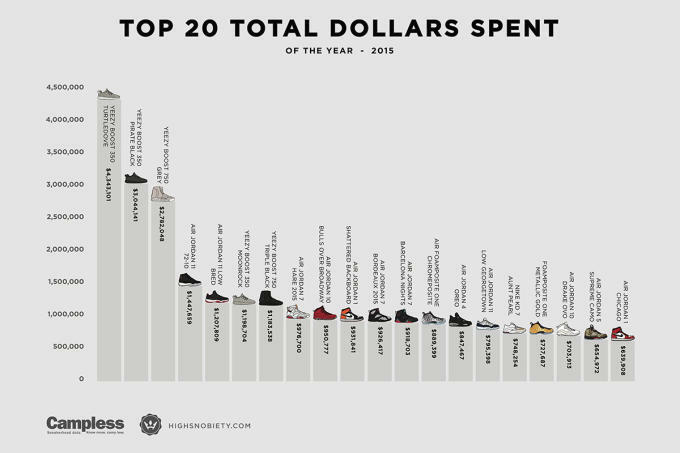 As you&apos;ll see, the Yeezy Boosts absolutely dominated the field in terms of total dollars spent. The "Turtle Dove" 350s took the top spot at $4.3 million, while the "Pirate Black" 350s followed with $3 million and the "Grey" 750s came in at three with $2.8 million in total sales. From there, a pair of Jordan XIs manage to sneak in to the next two spots, but then it&apos;s right back to the Yeezys with $1.2 million sales in "Moonrock" 350s and an additional $1.2 million spent on "Triple Black" 750s. All in all, we&apos;re looking at roughly $12.6 million spent on adidas Yeezy Boosts on eBay during 2015 alone. The exact number comes to a whopping $12,551,523, which is actually enough to top the combined totals of every Air Jordan sneaker on the list. To gives this some more perspective, that means that five Yeezys made more money on eBay in 2015 than the 12 most hyped Air Jordan sneakers combined. This isn&apos;t even taking the "Oxford Tan" 350s into consideration, as they didn&apos;t make the cut here due to their late December release. Read the entire feature, which includes the 20 most valuable sneakers of 2015, at Highsnobiety now.